A progressive open prison in Ireland, which is located in a historic abbey and set among landscaped gardens, is being evaluated by researchers at the University of Huddersfield. Sheldon Abbey offers a relaxed atmosphere and high levels of freedom to its prisoners – many of whom have committed violent crimes. But will the experiment lead to a cut in reoffending rates? That is the question that investigative psychologists Dr Maria Ioannou and Dr John Synnott hope to answer as they continue their research relationship with the prison in County Wicklow and its Governor, Conal Healy. Shelton Abbey has no locked cells and the 115 prisoners have freedom of movement within the jail. 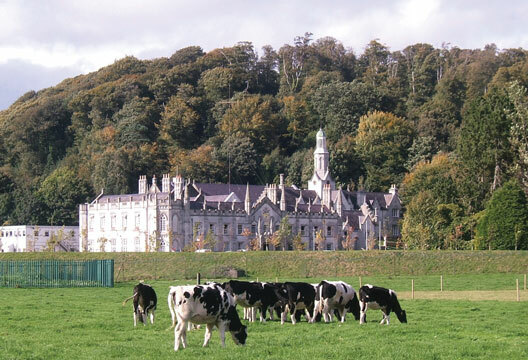 They work in the grounds and in an onsite farm with animals that are housed there before being distributed by Irish charity Bóthar, which provides livestock to developing communities around the world. Prisoners also have access to mobile communication as research shows that there is a direct link between rehabilitation and contact with the outside world. One of the rehabilitation schemes being run is the Buddy Dogs programme in which inmates care for and train dogs that are destined as companions and helpers for the disabled. Initially, Synnott and Ioannou – Assistant Course Director and Course Director respectively for the Huddersfield MSc in Investigative Psychology – were called in to evaluate the Buddy Dogs scheme. The researchers examined and compared participants and non-participants on the Buddy Dogs programme on four areas: depression, loneliness, self-esteem and perceived control. While no differences were found between participants in the groups, data from interviews with prison staff, charity staff and inmates illustrated the programme was effective and had a positive impact on the participating inmates as well as on the atmosphere within Sheldon Abbey. Now, the two University of Huddersfield experts aim to expand their research to explore the effectiveness of all its innovations and assist in implementing new rehabilitation approaches. They recently completed a project exploring wellbeing within the open centre facility that aims to contribute further to their understanding of such facilities. The fundamental debate about the prison system, he added, is its purpose. ‘Is it for punishment or rehabilitation? Is it about justice for the victim? The standard response from people on the street and in the media is that it should be punishment-based, but you can challenge that by citing figures that if you have been to prison once you have got over a 50 per cent chance of going back,’ he said.